If you want to see wild animals in Sweden… please don’t go straight to the zoo just because it is easy. It is far more rewarding to see animals in the wild. But where do you find wild animals? For example, where is the best place to go if you want to see a Moose or a Beaver in the wild? To help you out, I have compiled this list of 10 wild animals in Sweden and where to see them. Moose can be found all over Sweden, but they can still be difficult to find. If you travel through Sweden, don’t expect to see Moose everywhere. Your biggest chance is to see them from your car window, but it is always more impressive to meet a Moose while walking through a forest. How to see Moose in the wild: Moose spend most of their time in dense forests and pine tree plantations but it is easier to see them on fields and meadows simply because open areas means better viewing conditions. Moose that live close to villages and towns are used to people and therefore less shy. To make sure you see a Moose in Sweden you can join a guided Moose Safari. Natural predators: Man (hunting + traffic) Wolf, Brown Bear. Moose is the largest species of the deer family. It can be found all over Sweden except on Gotland and the outer islands. 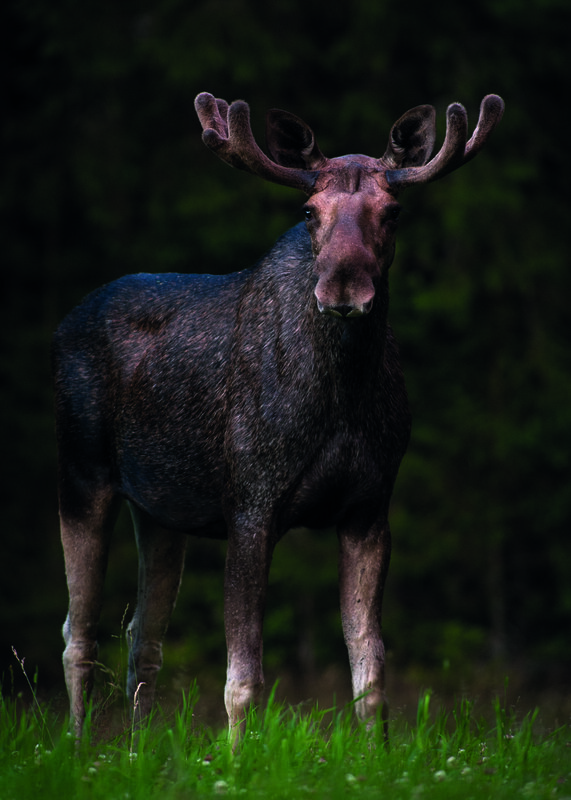 Sweden has a denser Moose population than any other country. Although hundreds of thousands of Moose inhabit Sweden they can still be difficult to see in the wild. Their diet consists of both terrestrial and aquatic vegetation. Unlike most other deer species, moose are solitary animals and do not form herds. The calves stay with their cow during their first year. What is the difference between Moose and Elk? Well, this is a hard one, so read carefully. The photo here shows a Moose (in American English) but it is also an Elk (in British English). Yes, Moose and Elk are the very same species. However, in North America there is another member of the Deer family, the Wapiti, which is also called Elk. So, the American Moose is the same as the European Elk. But the North American Elk is not the same as the European Elk. Confused? Here’s another way to say it: There are two different Elks, but only one Moose. And that’s the reason why I call it Moose. The Swedish name for Moose is Älg. Where to see Beavers in Sweden: Beavers are common in the central parts of Sweden and can be found in many rivers and lakes. There are less beavers in the Northern parts of the country and no beavers in very South, yet. How to see Beavers in Sweden: Beavers are rarely seen since they are nocturnal and aware of humans. They always live close to water, so you need to look for them by a lake, river or stream. Beavers have no natural enemies in the water, so if you are in a boat, they don’t recognize you as a threat. In this way you can get a lot closer without disturbing them. Look for their characteristic gnaw marks on trees. Aspen and Birch are their favorites. The next step is to look for a Beaver lodge and if you are in a stream you can look for a dam. If you see fresh sticks on top of the lodge or dam then you know that the Beavers are around. Note that Beavers don’t build dams in large lakes or rapid rivers and streams. The best way to see them is to wait near their lodge at around sunset. Stay still at a respectful distance. Be quiet. Have patience. There is a good chance that they will suddenly show up in the water in front of you. Dusk and dawn is when they are most active. To make sure you see them you can join a local guide on a Beaver Safari. Population in Sweden: The population is estimated to be at least 150,000. The European beaver is a species of beaver, which was once widespread in Sweden, but it was hunted to near extinction by the end of the nineteenth century. It was hunted both for fur and for castoreum, a secretion of its scent gland believed to have medicinal properties. Between 1922 and 1939 approximately eighty individuals were reintroduced into Sweden from Norway. Since the reintroduction the Beaver population has increased to an estimated 150,000 Beavers and it is now returning to much of its former range. The Scandinavian Wolf population is concentrated to the Southern parts of Central Sweden, which means the counties of Västmanland, Örebro, Värmland, Dalarna and Gävleborg. There are rarely any Wolves in the Northern half of Sweden, nor in the very South. How to see Wolves in Sweden: Wolves are elusive and difficult to see in the wild. You may have to search for years without succeeding. They move over vast eras and are well camouflaged. Most of Sweden’s Wolves live in densely forested areas with limited viewing conditions which makes it difficult to see them even if they would be close by. They also move long distances each day which makes it difficult to keep track of where they are. Hearing the Wolves howl is not only more likely, but perhaps more rewarding than seeing one. You can join a professional Wolf tracker for a guided tour in a Wolf territory. Population in Sweden: The population is estimated to be 400 – 500 (Winter 2014/2015). Wolves were hunted to extinction in Scandinavia during the 1800’s. But since the 1980’s when a few wolves managed to walk in from the Russian-Finish population they have returned to the fauna and still recovering. 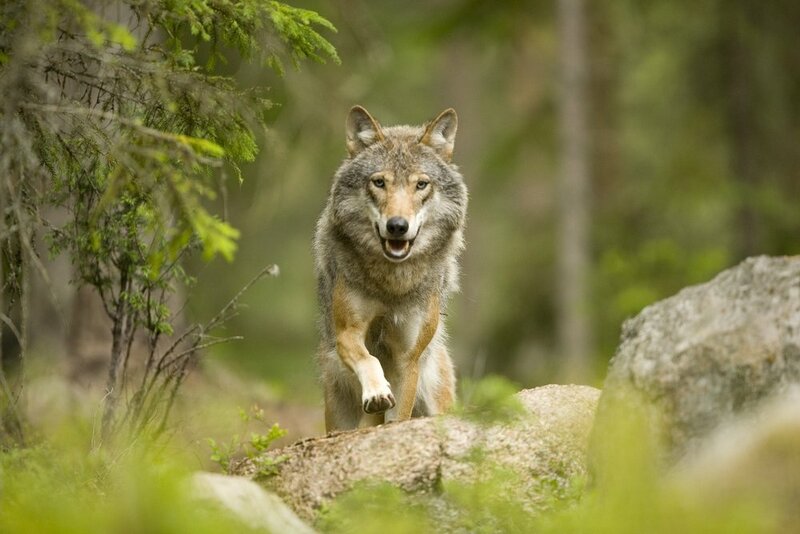 There are now about 300-400 wolves in Sweden. The Grey Wolf weighs males averaging 50 kg, and females 40 kg. Its winter fur is long and bushy, and is usually mottled gray/yellowish in color. The Grey Wolf is one of the world’s most well researched animals, with probably more books written about it than any other wildlife species. It is the sole ancestor of the dog, which was first domesticated in the Middle East. Bears can be found in the Northern two thirds of Sweden. Central Sweden with Dalarna, Gävleborg and Jämtland are the most densely populated areas with Bears in Sweden, perhaps even in Europe. 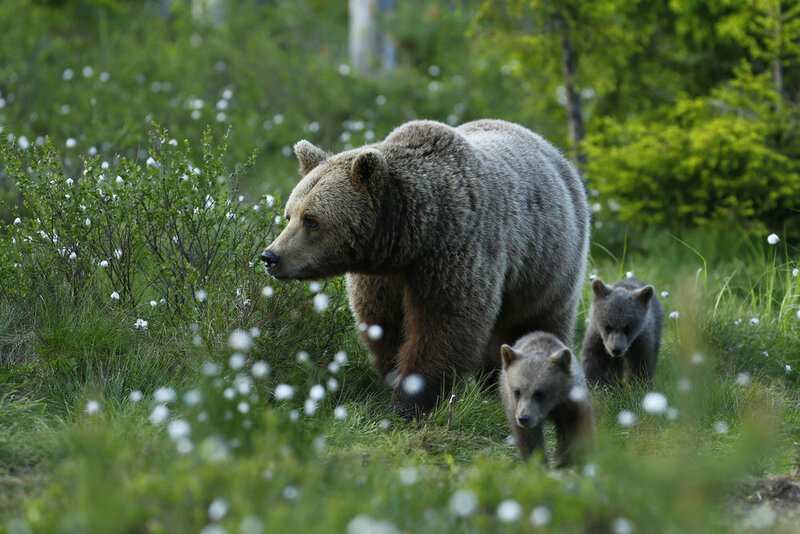 How to see Bears in Sweden: European Brown Bears are shy, peaceful and very difficult to see in the wild. Some people are lucky to spot bears as they feed on grass and herbs in open meadows and fields during May and June, before the berry season has begun. Others may see bears in the mountains when they feed on berries during late Summer and Autumn. To increase your chances to see bears in the forest, go with a professional wildlife tracker. These Brown Bear watching tours gives you good chances to watch and photograph Bears in the wild. The Swedish Brown Bear population has grown to a number of at about 3000 individuals, distributed across the central and northern parts of Sweden. Adult bears generally weigh between 100-300 kg for males and 60-200 for females. Bears are very shy and do not attack people, but should be respected and kept at a distance. The most common way to see a Brown Bear is from these Brown Bear photo hides in Hälsingland. Arctic Foxes can be found in the mountains of North-Western Sweden, particularly in the alpine areas of Jämtland, Västerbotten and Norrbotten. How to see Arctic Fox in Sweden: Most Arctic Fox populations are found in remote areas that can’t be reached by car. One of the hotspots worth mentioning is the Helags mountains in Härjedalen. 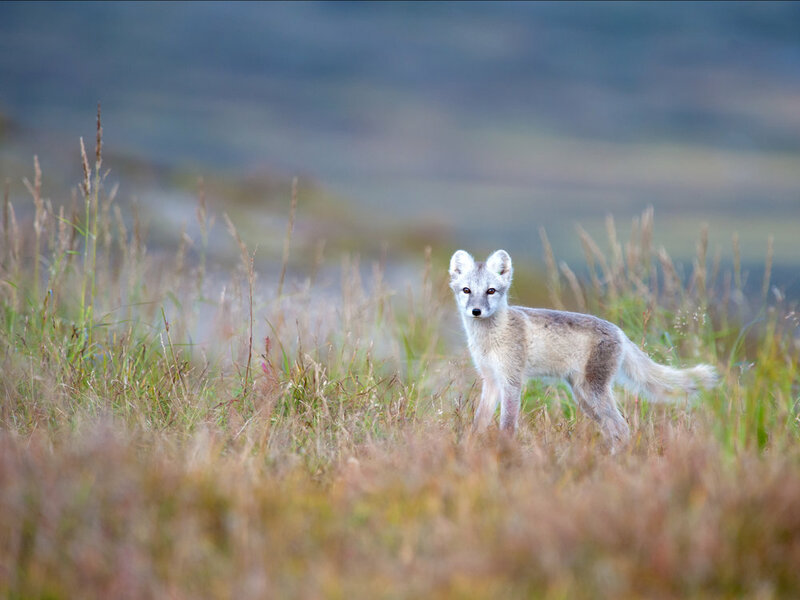 Helags mountain station offer guided tours to watch for Arctic Fox at their dens where you can expect to see them. Another place worth checking out is Stekenjokk between Jämtland and Västerbotten. During Summer you can drive across this area on the Wildnerness Road to search for Arctic Foxes and other wildlife. Population in Sweden: A few hundred. The Arctic Fox population has increased lately but varies greatly from season to season depending on access to food which mainly consists of lemmings and other rodents. The arctic fox is also known as the white fox, polar fox, or snow fox. It has a deep thick fur and is well adapted to living in Arctic environments. They form monogamous pairs during the breeding season and usually stay together in family groups of multiple generations in complex underground dens. White and blue foxes: Arctic Fox comes in two different color variations, one called white and one called blue. The white variation is white in Winter and grey with brown back, legs and face in Summer. The blue variation has a blueish-gray fur throughout the year. Both colour variations can exist in the same litter if the parents have genes for both. The white foxes are well camouflaged against the snow and therefore better adapted to survive. Most of the Arctic Fox in Sweden are of the white variation. Most people seem to think the Wolverine is a cartoon or movie character. It is perhaps the least known mammal in Sweden. Wolverine can be found primarily in remote reaches of Sweden’s mountainous regions. Like in Norrbotten, Västerbotten and Jämtland, but now also further South in the forested regions of Dalarna and Hälsingland. How to see Wolverines in Sweden: Well, it is not going to be easy. Most people see them at a distance by chance while skiing or snowmobiling in the mountains during Winter. They are easier to spot against the snowy white background. Bring binoculars. In recent years the Wolverine population has spread South-East into the forested regions of Central Sweden, namely into Dalarna, Värmland and Gävleborg. One of the Southernmost populations of Wolverine is in Gyllbergen in Dalarna. The reason they return to these regions is likely thanks to the Wolves comeback who leave a lot of leftovers for Wolverines and other carnivores. The wolverine is the largest terrestrial member of the weasel family. It is a larger cousin to otters, weasels and mink. The wolverine has a broad head, small eyes and short rounded ears with dark brown fur, and often has a lighter-colored face mask and stripe running down both sides of its body. The wolverine is powerfully built and has short legs with wide feet for traveling across the snow. The wolverine is a good tree climber and also a good swimmer. The Wolverine has a reputation for being greedy, but it is actually quite a bad hunter. Wolverines are opportunistic feeders which means they eat a variety of foods depending on availability. They primarily scavenge dead animals. However, they do take down animals much larger than themselves, including Reindeer, when snow conditions are in their favor. Wolverines are territorial animals and defend large, gender-exclusive territories. Male and female territories overlap each other, and they have strong family bonds. Young wolverines are called cubs or kits. The cubs keep to the mother until spring arrives the year after they were born. A male wolverine will interact with his cubs even after they have struck out on their own. Female wolverines give birth during winter in dens that provide security and a buffer to cold winter temperatures. These dens are generally tunneled through snow and are associated with uprooted trees, avalanche debris, and boulders, often in remote alpine cirques above tree line. Lynx is perhaps the most difficult mammal to spot in Sweden. Few people ever get to see a Lynx in the wild. Good news is that Lynx can be found all across Sweden. Some of the more densely populated areas are actually around Stockholm in Sörmland and Uppland and in Bergslagen. How to see Lynx in Sweden: Lynx are most active around dawn and dusk, especially during early mornings. That’s also when most people tend to see them. If you walk through the forest and a Lynx sees you as a threat, the Lynx will likely climb a tree and wait for your to pass by. So it may be a good idea to look upwards once in a while as you stroll through the woods. But driving around peering across fields and meadows around sunrise is probably your best bet. There are certain areas where you may have a bigger chance to actually spot a Lynx, but these areas are often kept a secret to avoid having too many people visiting. To visit one of these secret spots you can join a Lynx watching tour in Swedish Lapland. 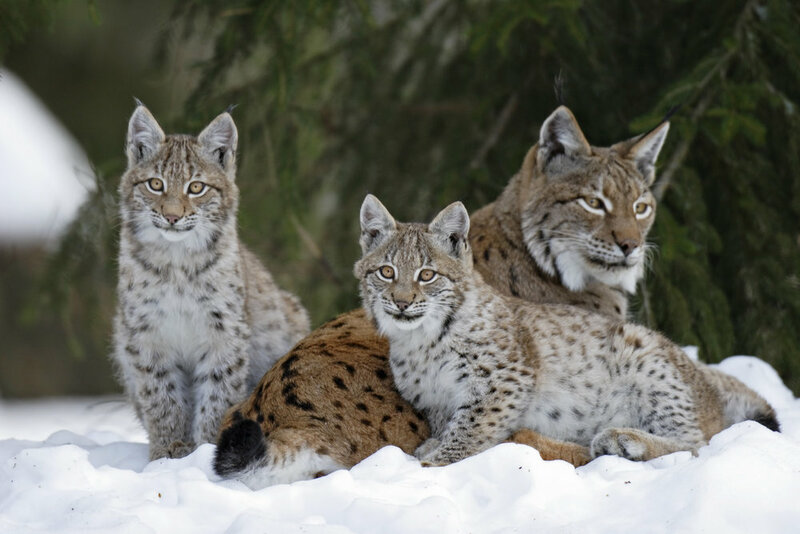 The Lynx is the largest cat animal in Europe and the third largest predator in Sweden after the Brown Bear and Wolf. It is the largest of the four lynx species in the World. It is a strict carnivore, consuming one or two kilograms of meat every day. This extremely efficient hunter uses fine-tuned techniques to bring down animals even larger than its own size, delivering a fatal bite to the neck or snout of an unsuspecting deer. In Northern Sweden Reindeer is their main prey while Roedeer is their main prey in the South. The Lynx has powerful legs, with slightly longer hind limbs adapted for springing. The large ears are adorned with conspicuous black tufts, and the long cheek hair hangs down to form a facial ruff, appearing almost mane-like in winter. The coat is long and extremely dense, especially over the winter, and is more variable in colouration than in any other felid. The Lynx males are inhabiting large home ranges, within which one or more females reside. While female territories tend to exhibit little overlap, male territories often overlap to some extent, although males normally avoid each other. The lynx uses various scent marks, including urine, faeces and scrapes to mark territory and also to communicate with neighbours. During mating season, usually by mid-March, both the males and females call to each other frequently. Towards the end of the gestation period, which lasts 67 to 74 days, the female finds a sheltered den to give birth to 1 – 4 kittens. At three months old the young are weaned and begin to accompany the female, eventually leaving just before the next mating season. Wild boar or Wild pig are two names for the same species. Wild boar can mainly be found in the Southern parts of Sweden. You can find more or less dense populations of Wild Boar in the Stockholm area and all the way down to Skåne. Södermanland is a good place to go if you want to see them in the wild. How to see Wild Boar in Sweden: Wild boar are shy creatures and rarely seen in daylight. Dusk and dawn offer the best chances to see them as they visit fields and meadows in search of food. Boars remain hidden in the protective vegetation during the day. Population in Sweden: The population is estimated to be at least 300,000. 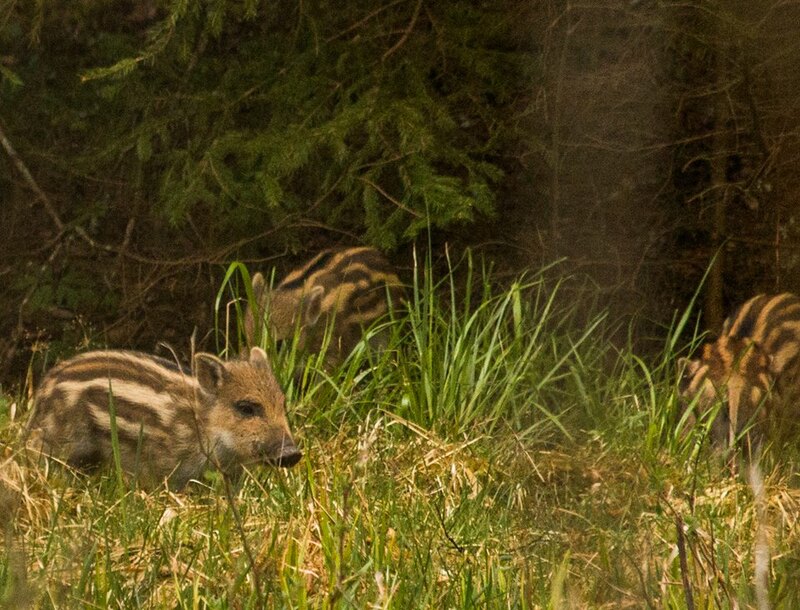 After two hundred years of absence the Wild Boar has made a strong return into the Swedish fauna. The species has a long history in Sweden which began more than 8,000 years ago. Wild boar was hunted to extinction, but was reintroduced in captivity. After several escapes during the 1970’s – and 1980’s, the wild population has increased in various parts of southern Sweden and is now estimated to over 300,000. The population is still growing at a fast rate as they populate new regions of Sweden at a steady pace. An adult boar is about 1 meter in height and just over 1.5 meters long. The sow (female) usually weigh over 100 kg, while the boar (male) is heavier and can weigh over 200 kg. The tusks in the lower jaw are sharp and shaped for grazing. These teeth are less developed in sows and piglets. The tusks have open roots, ie they grow throughout the animal’s lifetime. The Wild Boar are social animals and live in groups of sows with piglets. They usually live in groups of between 6 and 20 individuals, although larger herds have been seen. When a female piglet reach the age of one and new piglets are born, they leave the sow and form their own groups. They can later rejoin the original group – with or without their own piglets – and thus form even larger flocks. The group is led by the oldest sow. This dominant sow leads hikes, decide where to search for food and protects the offspring. Male boars that are older than two years live as loners except during mating season. Most matings occur in August to December. Swedish research has shown that about 85% of births take place during the months of February to May, but piglets can be born at any time of the year. Their data also suggest a small birth peak in August-September. In most cases, the sow gives birth to only one litter in a year. The size depends in part on the sow’s age. A young sow gives birth to an average of 3-4 piglets, while one who has reached the age of three breeds 5-6 and sometimes more. Boars are omnivorous, but most of the feed (about 90%) consisting of vegetables. Although it primarily feeds on fruits, seeds and roots, the Wild Boar eats a wide range of foods including some animal matter and scavenging from roadkills and the Wolves’ leftovers. In some areas, they cause damage to trees and crops. But their rooting also favor the spread of many plant species and may lead to more rapid nutrient cycling in forest soils. Want to see an Otter? They’re great little creatures! Most Otters live by the rivers in Northern Sweden, but the population is also increasing in the South. Most otters live near fresh water, but can also live in marine environments along the coast. 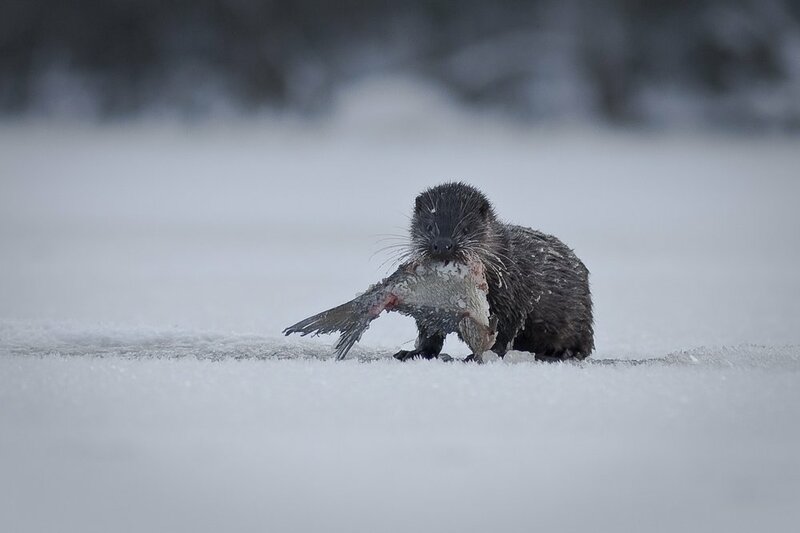 A known hotspot for Otters in the wild is at Gysinge bruk by river Dalälven in Färnebofjärden National Park where you may be lucky to see them playing on the ice during Winter. As with most mammals they are mainly active at dusk and dawn. An adult female Otter weighs between 5 – 6 kg, an adult male weighs about twice as much. Males are about 1 meter long and the females around 90 centimeters, with the tail. It has a sleek brown fur, which is often paler on the underside, and a long body with a thick tail and short legs. Adaptations for an aquatic lifestyle include webbed feet, the ability to close the small ears and the nose when under water, and very dense, short fur which traps a layer of air to insulate the body. Many sensitive hairs frame the snout which help the otter to locate prey. Otters feed mainly on fish, but frogs are also an important food source. They can also eat crayfish, birds and small mammals. The otter have a rich social life and is often playful. Breeding can occur throughout the year; one or two cubs are usually born in a den known as a holt, and ten weeks later the cubs emerge above ground with their mother. Female Otters care for their offspring for about a year. but it may take the cubs up to 18 months to learn to fish, and females have ben observed helping this learning process by releasing live fish for the cubs to re-catch. The Swedish Otter population is rising again after it was close to extinction in the 1950’s, which was probably due to environmental toxins and especially PCBs. It is now recovering and increasing in numbers. The population in Sweden is estimated to 1500 – 2000 individuals. Today, traffic is a bigger problem.